Each profile represents a set of settings that are required for a certain location or scenario. By using subprofiles multiple network adapters can be configured with one profile. Rename a profile by double-clicking its tab caption. You need to configure the required profiles manually yourself. It's not possible to guess the correct settings for an unknown location. The main purpose of the application is to automate regular settings changes that you'd usually do manually. Reading all current settings into a profile can give you a starting point, but you still need to decide which settings to apply when activating that profile. It's highly recommended to limit the settings to those that might've actually been changed in the meantime. For example it isn't necessary to apply a computer name if this setting is never changed. To configure a setting check its checkbox first, then either enter the desired configuration directly in the main interface or open the configuration dialog for that particular setting. By default no profile is activated automatically, i.e. no setting on your system is changed without your intention. Having said that, you can use the AutoSwitch feature to activate certain profiles automatically based on freely customizable conditions. It's recommended to keep NetSetMan minimized in the tray and move the tray icon into the always visible area. That way you can quickly activate a profile by clicking on the icon and selecting a profile. Additionally you'll have a useful overview over your current connection IPs by hovering over the icon with your mouse cursor. The tabs represent the available profiles. You can save 6 different sets of settings in those tabs. If you'd like to change the settings of two different network adapters when activating a single profile, you can use the Subprofile feature. Click the "+"-button beside the NIC dropdown list and a new menu bar will appear containing two subprofiles (the current one and a new empty one). The caption will be automatically the name of the network adapter that is selected in that subprofile and can't be changed. You can create as many subprofiles as you like. All of them will be activated one after another when the profile is activated. You can rearrange the order by drag-and-drop. All changes are saved automatically so nothing gets lost accidentally. You can rename a profile by right-clicking it and choosing "Rename" or simply double-clicking its tab caption. To manage all your profiles more easily you can use the Profile Management that you'll find in the menu bar. It allows editing profiles, subprofiles and groups (only in NetSetMan Pro) with your mouse or some common keyboard shortcuts (arrow keys for navigation, F2 for renaming, etc.). When using drag-and-drop to rearrange items you'll notice some unavoidable restrictions depending on the item, due to given technical circumstances: Profiles can't be deleted, MultiProfiles can't be renamed, Profiles can be swapped but not moved. The checkboxes represent whether the according profile will be visible in tray and in Compact Mode. All available network adapters are displayed by their name and their type. Select the NIC you'd like to manage in the current (sub)profile. If a certain NIC is not available in the list (e.g. because it's deactivated or virtual) you can manage the list by clicking the Refresh button and either quickly updating the list or choosing Manage network adapters. There you'll find a complete list of all available NICs. Check all NICs that you want to have in your list. Note: All NICs that are included in that list will also appear in the Tray Info. Uncheck unwanted NICs to remove them from the list and the Tray Info. If you copy the settings file (settings.ini) to another system, NetSetMan will try to reassign NICs in the profiles automatically. However this will only work if the new system has a NIC with exactly the same name (in the first screenshot it's "LAN"). To load a current setting into the profile just click on the symbol beside the entry field. To get all current settings right-click the profile and choose "Get Current Settings". To clear the configuration of a certain setting right-click it and choose "Clear". To clear the values of an IP field simply double-click on its corresponding caption. To clear all settings of the current (sub)profile right-click the profile tab and choose "Clear Settings". To transfer settings between different profiles you can copy and paste a whole profile by right-clicking the original profile, choosing "Copy Settings", then right-clicking the new profile and choosing "Paste Settings". To copy and paste only a specific setting simply right-click it and choose "Copy" or "Paste". To apply all settings of the current profile click on "Activate" or if the program is running minimized select the profile from the tray menu. Notice that only settings with a checked checkbox will be activated. The Activation dialog contains information about the current activation progress. There you can see which settings are going to be applied and whether the process is successful or not. You can cancel the activation process by clicking the "Cancel"-button at any time. All changes are applied immediately. However, in certain cases some settings take a short while to take full effect or require a reboot (especially "PC Name" and "Workgroup/Domain"). The Details section provides an overview of all the configured settings for that profile. To view more information and error messages in full length open up the Log section. To find solutions for the most common errors and problems have a look at the FAQ. OK Everything worked as expected. ... Settings are currently being applied. - Settings were ignored without trying, because they were incomplete or erroneous. Error In most cases errors are shown as a short red text like "File not found". In case you receive an error code have a look at the log to find out if an error message exists for that code. If you have no idea what the reason is, please post the error code and a detailed error description in the support forums. FF is active Firefox is currently running. To apply those settings you have to close the browser first. Besides the classic "Full Mode" interface, where you can change all settings of a profile, an additional interface "Compact Mode" is available. You can switch between those modes at any time by clicking the according button in the main menu on the right. Once all profiles are set up the Compact Mode is the ideal interface. Here you have a compact overview of all settings of a profile without worrying about settings being modified accidentally. In case you use the NSM Administration (with "Change profile settings" being unchecked) the Compact Mode will be used automatically to prevent the user from being able to change settings. When NetSetMan is running you'll find its icon in the tray bar (beside the clock). There you can quickly activate a profile. Just right-click the icon to open the Tray Menu and choose the profile to activate. If you'd like to exclude some profiles from appearing in the tray, you can hide them individually. 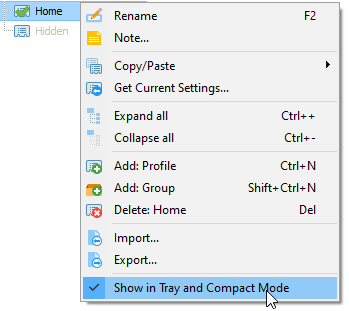 To do this select the profile in the main window, right-click on the tab and click "Show in Tray and Compact Mode". The small symbol beside the text shows whether this profile will be available in the tray. This option will also have effect on the profiles shown in Compact Mode. Profile visibility can also be configured in the Profile Management. If you rest your cursor over the NetSetMan icon in the tray the Tray Info will appear. It contains the current IP information that is used by the system. Because that data is gathered in real time, you might experience a short delay. To reduce that delay you should consider turning off additional information like public IP and MAC addresses in the Preferences. 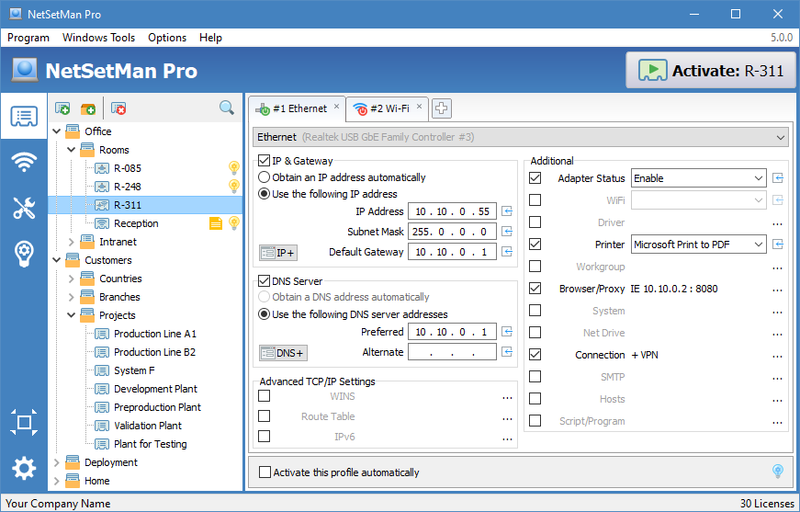 NetSetMan is designed in a way that allows you to have a direct overview of all configured settings within a profile. Some of the most important features like the basic IP settings, WiFi and the default printer can be configured directly on the main interface. Other, more complex settings can only be enabled here and will show a brief overview over their current configuration. To modify them activate them first, then open the according dialog by clicking the [...]-button. The following sections will give you basic instructions and useful tips on how to use all the features. To activate, deactivate or restart the selected network adapter use the Adapter Status button. The default color will change to a status-related color. Additionally you can see the configured status in the tooltip. If you want to enable one adapter and disable one or all other adapters, you need to create subprofiles for each of the adapters. You can do this manually or by using the menu item at the bottom of the Adapter Status menu. It'll automatically create a subprofile for each network adapter that is included in the adapter list and set its status setting accordingly. Remember that you can customize which adapters are included in that list by using the Network Adapter Management. You can specify multiple IP, Gateway, DNS and WINS addresses per NIC if you need to be in several networks at the same time. To do so click the "IP+" button or choose "Profile › Advanced TCP/IP Settings" from the main menu. Here you also have the possibility to manage more advanced settings like the Route Table, DNS Suffix, IPConfig and NetBIOS. Use this feature to connect or disconnect any kind of Windows connection like dial-up networks, mobile broadband or VPN. Compatible connections are listed in Windows together with your normal network adapters in the Network Connections dialog. From a technical point of view all connections that are compatible with "RasDial" are supported. You can choose to either disconnect all currently established connections by checking the checkbox, or to connect/disconnect some connections individually in order of the listing. If your connection isn’t listed for some reason, you can manually add it by choosing „Add…“ in the selection list and entering its name as displayed in Windows. NetSetMan also supports several third-party VPN clients like OpenVPN, Shrew and Cisco. If your VPN client is compatible, NetSetMan will list its VPN profiles in the selection list. In very specific cases it might be necessary or useful to manually assign IPs to names or domains. Notice that NetSetMan will only modify its own hosts entries leaving already existing entries untouched. With NetSetMan you can map and unmap an unlimited amount of network drives. Please read the instruction notes at the bottom of the window by clicking "[ Show Help ]". When a profile is activated and the Net Drive feature is selected NetSetMan will compare the list of all currently mapped drives with the list of the drives to be mapped. All mapped drives that are in both lists (same drive letter and same location path) will remain untouched. All other network drives will be unmapped before the new ones are mapped. NetSetMan offers you a comfortable way to manage your script files. However, it has no own script language. This means you can only use script languages your operating system is able to execute. Common script languages are VBS, JS and even simple command-line batch files. Use your favorite search engine to find more information about scripting and what you can do with it. Open an existing script file or create a new one to be able to edit the script. You can have two scripts that will be executed before and after all other settings are changed. If you need a delay between running the script and changing the network settings, you can specify it at the bottom. NetSetMan offers a convenient way to run external programs with each profile. Programs can be launched in a limited user context (default with UAC enabled) or elevated with administrator privileges (without triggering a UAC prompt). Parameters can be added if required. Programs can be launched normally, maximized or minimized (if supported). Already running processes can be stopped based on their file name (regardless of where they are located) or on their exact file path. Each action can have an individual delay before (negative value) or after (positive value) execution. In some cases the IP address of the SMTP server for sending emails varies depending on your network. Being in the same network you might need a local IP address like 10.0.0.1, while being outside of that network you might need to access it by a global IP address. Instead of trying to be compatible to a lot of different email clients and dealing with different user profiles NetSetMan solves this issue with a simple workaround. 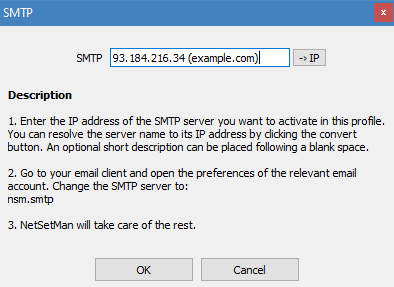 Set "nsm.smtp" as the SMTP address in your email client and configure the IP addresses in the according profiles. When activating the profile both values will be linked using the hosts file so you don't need to do any additional changes in your email client anymore. Additionally to the usual network settings sometimes you might want to change some system settings depending on your location or situation. For example while at university you might want to mute the sound volume, change the wallpaper and activate the Balanced power plan. You can also use the System Settings dialog to quickly change some setting that would otherwise take more time finding the location of that setting in Windows. Simply click the button to directly activate that particular setting. Supported settings include: display mode, wallpaper, desktop color, screensaver, design scheme, speakers & microphone volume, sound scheme, firewall (incl. exceptions & notifications), power plan, time zone and MAC address. 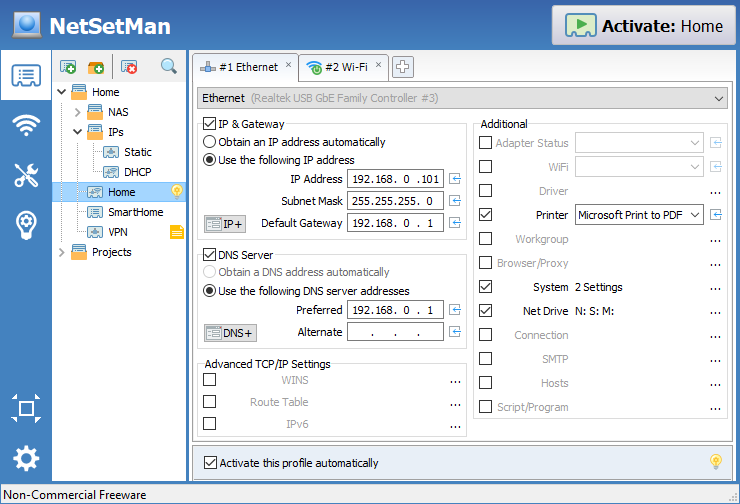 A NetSetMan profile can be used to connect to an existing WiFi profile. To do this, select a WiFi adapter in the NICs dropdown list, then select a WiFi profile from the WiFi dropdown list. If you only want to disconnect your WiFi connection, choose the empty entry. Besides this basic WiFi switch NetSetMan offers an extensive WiFi management. Click the WiFi icon or use the main menu (Tools › NSM WiFi Management) to access it. You'll find a list of all currently available WiFi networks. 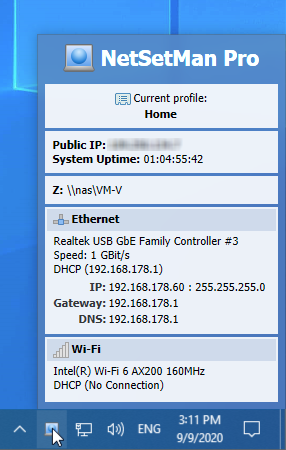 A yellow background indicates that a profile with the same SSID already exists. A network with a green background is currently connected. You can connect to a network by double-clicking it or using the "Connect"-Button. If there's no existing profile for this connection you can choose to create it first. The settings (authentication, encryption, ...) will be pre-configured automatically depending on the recognized network. However, you might need to adjust them in case the recognition didn't work correctly for some reason. 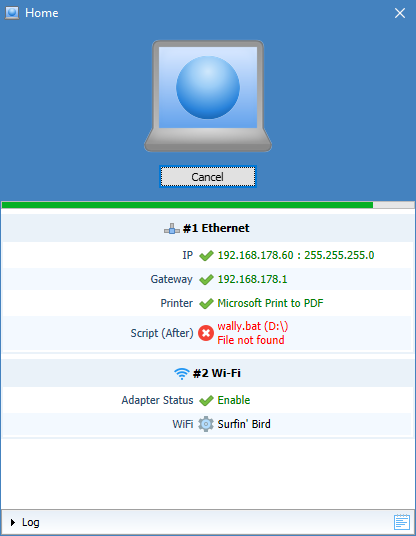 NetSetMan works with the native Windows WiFi profiles. This means that you always have access to the same profiles that you already used in Windows or some other WiFi software. You can create, modify or delete WiFi profiles. NetSetMan uses the native WiFi API of Windows. That brings the big advantage that no new drivers need to be installed (which might result in several conflicts). On the downside the WiFi features of NetSetMan will only work on Windows systems that already support WiFi. Fortunately most of the versions used nowadays do so. If you use Vista or later you're good to go. In XP you need to have SP2 or SP3 installed. Make sure the service WLAN AutoConfig (Wlansvc) (Vista and later) or Wireless Zero Configuration (WZCSVC) (XP) is running. If your WiFi adapter comes with a custom manufacturer software to manage WiFi settings, then it'll block Windows access in most cases. You'll need to find the option to switch to Windows management in that software (if available). Because there are many different manufacturers with their own software, there's no universal way to achieve this. Here's one example: If you're using an AVM FRITZ!WLAN USB device, click the tray icon of its software and choose "Windows WLAN". It's pretty easy to activate a profile with one click from the Tray Menu. But in some cases it might be even easier to activate profiles completely automatically depending on custom conditions. The integrated AutoSwitch feature does exactly that. Although there's no technical limitation for the amount of conditions per profile try to keep it as simple as possible. In most cases it's absolutely sufficient to include one or two conditions to achieve the desired result. You can specify that either all or at least one of the conditions must be met to activate that profile. Note: Profiles with lower IDs have a higher priority in case conditions for multiple profiles are met at the same time. By default the activation process is initiated with a message in the bottom right corner with a customizable delay countdown, allowing you to optionally abort the activation process. Alternatively a native Windows notification can be used or the profile can be activated without any message in the background. In the latter case the tray icon will be animated during the activation process and change its color temporarily according to the activation result to visually inform you about the automated process. To save system resources NetSetMan does not compare your current settings to the settings of the profile to be activated. This means that if you change any of your settings manually, NetSetMan won't notice the change. AutoSwitch has some limitations in XP: Windows NLM isn't available; Changes in the surrounding WiFi networks might be recognized with a noticeable delay. You can create short notes for every profile if you need to remember or indicate the purpose of a profile. If a note was created for a profile its icon will appear colored in the menu bar. The note is then visible in Full Mode as a hint of the icon and in Compact Mode at the top of the profile settings. NetSetMan requires administrator privileges to be able to change network and system settings for you. Normally running such an application isn't possible for a limited user account. Newer Windows versions even limit Administrator accounts with UAC (User Account Control) showing a message at each program start. To solve this issue NetSetMan includes a special component called NSM Service that provides the main application with the required privileges. The service is installed automatically but can also be manually installed/uninstalled in the preferences (System Privileges › Activate/Deactivate). If you get the error "Invalid signature", make sure the program exe hasn't been modified and the Windows group policy "Turn off Automatic Root Certificates Update" is disabled. If you run NetSetMan with a limited user account where the NSM Service isn't available you'll receive a message explaining the problem. 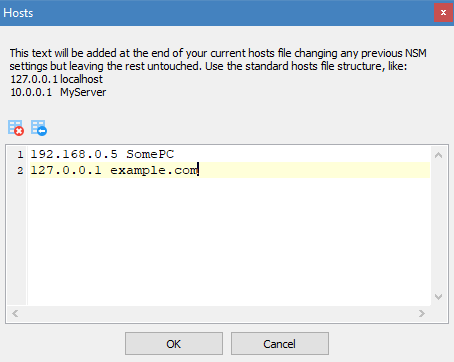 As an alternative you can input administrator credentials from a local account that NetSetMan will store encrypted in its settings file and use to launch itself with the required privileges. Notice that in this case the application will run in the context of the user whose credentials were used. Check the FAQ to read some additional notes about this feature. A very unique and powerful feature is the possibility to activate your profiles on the logon screen. This allows preparing correct network settings that you need for your account by activating a NetSetMan profile before even logging on. To use this feature NSM Service must be installed and the option "Profile switching from Windows logon screen" (Preferences › System Privileges) must be enabled. Notice that this feature only allows to change settings that are shared between all users. User specific settings cannot be changed outside of a user session. If you set up NetSetMan for being used by somebody else, you might want to specify what actions the other person is allowed to perform. With the NSM Administration (Preferences › Administration) you can do exactly that. When you activate this mode you'll have to enter a password with 6 or more characters. Only with this password you'll be able to change NSM Administration settings or perform the actions that you chose to be secured (run NetSetMan, activate profiles, change profile settings, change program settings). You can even lock certain preconfigured profiles so the user cannot modify but is still able to activate them. Or you can generally restrict access to certain settings like "Workgroup & Domain" while allowing the user to configure and use all other settings. A checksum of your password will be written to the registry. Make sure a normal user has no write privileges to HKLM\Software\NetSetMan (on x64: HKLM\Software\Wow6432Node\NetSetMan). If you forget your password, you will need to delete that key manually. If your settings file is encrypted nobody without the password will be able to view or edit it. In some special cases you might want to change your profile without using the GUI of NetSetMan: change profiles with shortcuts, activate a profile on startup, include it in a complex script, etc. -m / -multi Runs a second instance of NetSetMan. Be careful: All active instances write to the same settings file! 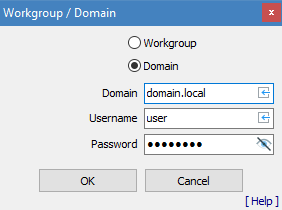 This message in the main window will appear at every 7th start for users in a workgroup and at every 2nd start for users in a domain, on average. Unfortunately this is necessary to remind users that NetSetMan is only Freeware for non-commercial purposes (= private or voluntary). In sum: You may use the product for free as long as you don't save paid work time. If you'd like to use the product for example at work or on a commercially used laptop, you are required to purchase a NetSetMan Pro license. There is no special regulation for educational or non-profit institutions. Professors, teachers and other employees may only use the Non-Commercial Freeware version if they're working in an honorary capacity (= unpaid). Please read the license agreement for further information. This message is not included in the Pro version, of course. With NetSetMan Pro you are able to create an unlimited amount of profile groups. Each group contains 6 profiles. To add, delete, rearrange or rename a profile group use the profile management in the menu bar. To navigate between all available profile groups choose any group from the drop-down field in the menu bar. If you have more than one group, your profiles will be shown grouped in the tray menu. With NetSetMan Pro you can manage the proxy settings of Windows / Internet Explorer, Firefox and Opera (<= v12). Chrome and later versions of Opera don't support own proxy settings but instead automatically use the system settings. All settings are intended to mimic the original interfaces to allow the same configuration that's also possible in the browsers directly. If you'd like to remove proxy settings when activating a profile, make sure to check the Proxy checkbox and remove all settings in the corresponding settings-group. Additionally you can change the home page and in case you're using profiles in Firefox or Opera you'll also be able to select the profile name. Please notice that Firefox must be closed before changing its settings. If you have multiple Firefox profiles and their profile folder changes (e.g. because of a new system) you'll need to re-select the profile in the list so it gets updated in your settings file. To join a domain enter its name, your user name and your password. Your user name and password will be stored encrypted in the ini-file. NetSetMan can only join you to a domain if your domain user account has the permission to do so. This user account privilege is called "Add Workstation to Domain" and must be enabled on your account. If you don't have this privilege, please ask your network administrator to grant you that. NetSetMan Pro offers several assisting features that help you distributing the software, pre-configured settings and your license more easily in your company network. You'll find everything you need to know in a detailed description in the FAQ.